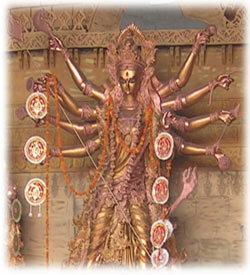 The celebration of Goddess Durga is performed in the name of Dussehra. "Dussehra" means "victory of the tenth day".Dussehra is also called as "Navaratri" meaning 9 days. The first 3 days pujas are performed for "Durga". The second 3 days is for "Lakshmi" and the last 3 days is dedicated for Goddess Saraswati. Durga homam can be performed in house or office to avoid the negative effects and to improve the efficiency. The online pooja for durga can be performed on your behalf.